For the opening of the day's lesson, our teacher had us look in the hymn book and find our favorite song. Then, we were to look up the scripture references at the bottom of the page. I am ashamed I have never really done this before. There are some great verses hidden in there! As I read the lyrics of the song, the third verse seemed to call my name. Often times when we go through trials, it can be super hard to see the point of all the suffering and pain we are feeling. Worst of all, it can seem like we are enduring the pain alone. I love this song because it reminds us that our Savior, Jesus Christ is with us every single step of the way. If he calls us to wade through deep waters, he doesn't just wave goodbye and wish us luck. He guides us, directs us, catches us when we fall, and keeps us afloat. Though the journey is hard, His grace has the power to sanctify our deepest distresses and turn them into our richest blessings. How cool is that? When we build on the firm foundation of Jesus Christ, we are never alone. 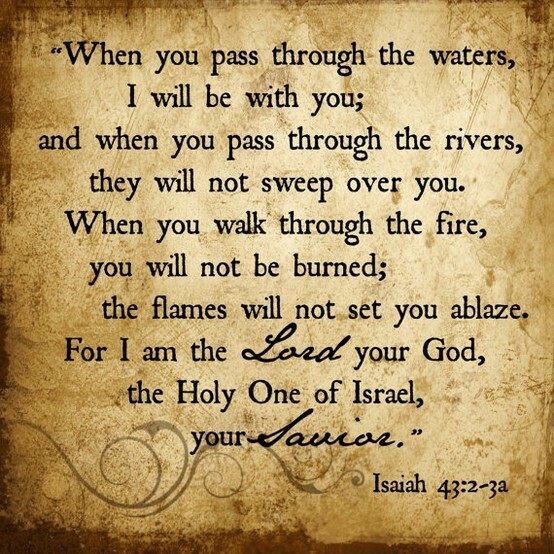 Even when waters are deep and fires are blazing, the Lord is with us. As we turn to Him, we will find strength to endure. So keep wading through those waters. Keep fighting those fires. With the Savior's help, you're going to make it.